This is Little Brown Bear. He was a gift from my then girlfriend (now wife) some 14 years ago. This was before I was a voice actor, and before we had children, and, of course, before we were married. He came with a bouquet of flowers that he likes to remind me are long since dead. 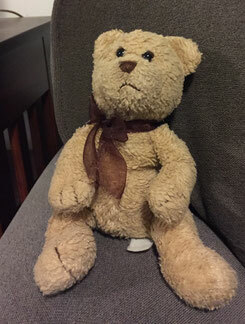 Little Brown Bear immediately developed a character and a personality - I was always going to be a voice actor. He’s a little obnoxious, but spirited and enthusiastic about the things he likes: bears, eating fish, and the Cubs. Little Brown Bear only likes bear themed sports teams (Cubs, Bears, Bruins, Grizzlies), with his favorite team being the Cubs. He’s fond of saying, “I love the Cubs,” followed by a sigh. I’m a lifelong Red Sox fan, and Little Brown Bear was disappointed that the Red Sox broke their World Series curse on 2004. He wouldn’t talk to me for a week. He wanted to maul Steve Bartmann in 2003, and now he’s nervous for Game 7. Kids have always loved him - nieces, nephews and now my own kids. My 9 year old is a Cubs fan also, and they are rooting for the Cubs tonight together. Little Brown Bear allowed me to practice my voices, acting and improvisational skills while I worked in other industries, and before I discovered I could make a living talking into a mic. My voiceover career owes him a debt of gratitude.